In the wake of controversy surrounding a death threat against the creators of the animated comedy "South Park" for depicting the prophet Muhammad dressed as a bear, the Council on American-Islamic Relations (CAIR) has made clear that its renewed effort to combat extremism is limited to countering its pick of "credible" extremists. According to CAIR, RevolutionMuslim.com, the website on which the threat against South Park's co-creators was posted, and Zachary Chesser, a Muslim convert now known as Abu Talhah Al-Amrikee, the individual who posted the threat, don't make the cut for dangerous influences. CAIR spokesman Ibrahim Hooper wrote off the RevolutionMuslim.com site as "an extreme fringe group that has absolutely no credibility within the Muslim community." "In fact, most Muslims suspect they were set up only to make Muslims look bad," Hooper added. "We just have very deep suspicions. They say such outrageous, irresponsible things that it almost seems like they're doing it to smear Islam." Hooper is setting up a false choice. 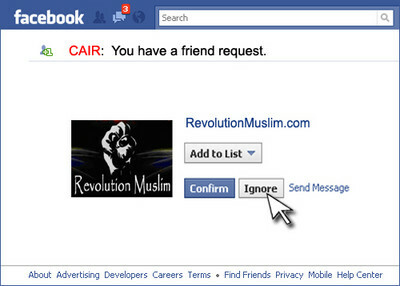 If RevolutionMuslim.com is a fringe group – and it most certainly is – then CAIR must be mainstream. That's not the case. CAIR is a Muslim Brotherhood-tied advocacy group that is implicated in a terror-financing scheme and has a demonstrated history of supporting and defending radical Islamists. It lacks the standing to judge who does and does not speak for American Muslims, though it claims the role for itself. As writer Mark Tapson notes, CAIR's response falls far short of wholeheartedly defending free speech. The normally media savvy CAIR "is throwing away a golden opportunity to explain exactly how these 'crazies' have 'hijacked' the religion. This would be the perfect time to discredit their 'outrageous, irresponsible' distortions, wouldn't it? And to stand with the South Park creators in defense of free speech?" Monday, CAIR-Chicago Executive Director Ahmed Rehab offered up a similar dismissal of the site's extremism, calling the group fraudulent. "The 'Muslims' in this case are a group of literally 5-10 people who are widely reviled by the mainstream community for their radical and confrontational style," Rehab wrote in an article for the Chicago Tribune. "Whether, true Muslim or agent provocateurs, the result is the same: they are five community outcasts." Former Dutch Parliamentarian Ayaan Hirsi Ali challenged this "outcast" argument in the Wall Street Journal Tuesday asking, "How much harm can an Islamist fringe group do in a free society?" Plenty, as she knows first hand. Hirsi Ali wrote the screenplay for the film "Submission" with Theo van Gogh, a Dutch filmmaker who was murdered in 2004 for the film's critical nature of women's role in Islam. In his online posting, Al-Amrikee threatened that South Park creators Trey Parker and Matt Stone would "probably end up like" Van Gogh. Ali reminds us that Van Gogh was murdered by Mohammed Bouyeri, a Dutch-Moroccan Muslim previously thought to have been a minor actor in radical circles. Ali uses this example to argue that fringe groups have the potential to do "a lot" of harm. "Young people are targeted by extremists on the Internet. They need access to mainstream views. The best way is at the chapter level. This is one of our top priorities nationwide." RevolutionMuslim.com offers anything but what Hooper deems "mainstream" views for readers. For example, the web page direct readers to a YouTube video praising Osama bin Laden. In the video a Muslim leader says of bin Laden, "By Allah I bear witness that I could not find an equal to him in the whole of the Islamic world. So we ask to protect his religion and his wealth and to bless him in this life." The site also links to a 2009 address by Osama bin Laden to the American people, a piece by Al-Qaeda leader Ayman Al-Zawahiri, a release from Al-Qaeda in the Arabian Peninsula, and writings by Muslim Brotherhood Egyptian ideologue Sayyid Qutb. Arabic documents are translated into English for easy accessibility by readers. "To CAIR: Why don't you spend more time congratulating Muslims when they do something good? Also, why don't you guys ever condemn the United States when they blow up entire Muslim villages? Are those thirteen people whom Muj. Hassan sent to Hellfire better than the hundreds who are murdered weekly in Afghanistan? Go learn your religion." Reader comments on Al-Amrikee's blog, themujahidblog.com, indicate that several individuals have gained an interest in becoming a mujahideen after reading his postings. Below his posting "How to Help the Mujahideen" one reader, zainab, comments "I wnt to becom muhajid?how can u help me?" Another comment by ismallianto reads, "I also want to be mujahideen…pls email me if u can help me" even providing an email address. Al-Amrikee cites the Qur'an throughout this article in which he states, "We have to actually go and fight against the disbelievers." In December of 2009 CAIR announced its plan to launch a website as an online resource center for Muslims who are vulnerable to extremist ideologies. Executive Director Nihad Awad said the idea is to refute the misuse of verses from the Qur'an and hadiths "that are commonly misused by recruiters or young people who do not understand the depths and circumstances of revelations and just juxtapose superficial and disconnected meaning to justify their actions." Al-Amrikee is doing exactly what Awad vowed to combat, but CAIR isn't taking on the content of his message. In another Al-Amrikee blog posting entitled "Open Source Jihad" (OSJ) he encourages individuals to perform jihad even if it is not organized. He writes, "Today the support for jihad is so great, al-hamdulillah, that someone who simply wants to please Allah, but has done little studying can be easily motivated to go and fight." He adds, "OSJ has even become a method used by the likes of Al-Qa'ida on a structural level. All of the various Al-Qa'idas out there are largely independent." He even supports Anwar al-Awlaki, calling him the "first westerner to pioneer the concept of open source jihad." Considering the website's postings and CAIR's stated goals of countering such material, the organization's dismissal of the ability of Al-Amrikee and RevolutionMuslim.com to radicalize vulnerable individuals is disturbing.